So I am clearly not the queen of taking selfies….oh well. I actually love how soft this scarfy is. I don’t plan to wear it as a fashion accessory, I plan to wear it against the cold, balled up around my neck and throat. The fabric, which comes with rufflies already attached, was actually very simple to work with. This was a pleasant surprise. I thought it would be so difficult to get each layer to lay flat in a seam! Maybe THAT is the secret to sewing success. Always assume it’s going to be challenging. Never assume you will just “whip it up”…. Actually, friends, I feel like I have stumbled onto something big here. Maybe I should take that attitude in life! Plan it out for challenging, don’t assume ANYTHING is just going to be oh so easy…..
I’m sad. I sewed all morning this morning. I have nothing to show for it. I have all these projects with unfinished business. They are just dragging on and on. I have all these new projects in my head! 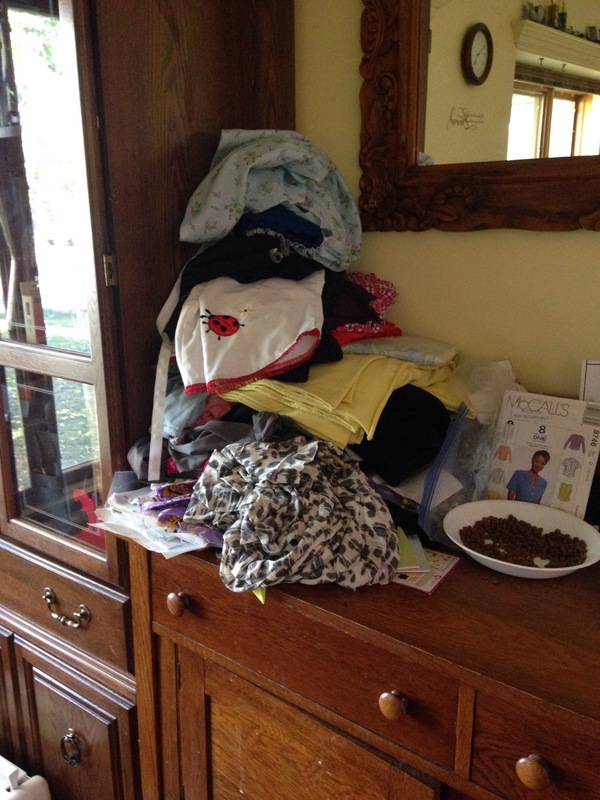 I want to get them out so my family and I can wear them…but today my to do pile grew even more rather than shrinking down, even a little bit, after sewing all morning. What matters more, rushing through projects, or enjoying the precision and perfection of a job well done? Well we are past the halfway point in September. I thought I would have all this extra time to SEW and make better suppers and clean and purge my house with one more kid in school. I haven’t even seen all my coffee buddies yet this month. I lined up 5 sewing projects for the month of September, roughly one a week. It’s the 16th of September, and I’m 1/2 way through my first project, and I still have 2 unfinished sewing projects from August. So. I gave my head a bit of a shake today. I struggle in all aspects of my life with the 80 20 ratio. I can get 80% of the way beautifully on my own but that last 20% of absolutely every little thing I drop the ball on. Almost. Almost. I’m at almost, all the time. So I am going to ground myself a bit. Before I take on the 5 new projects I want to accomplish, I mean really what was I honestly thinking, 5!? Before I take all that on, I think I will focus on wrapping up some loose ends. First things first, find the dress I lost before I could hem it, and finish it, and then blog about it! It’s soooo cute! It’s the Chesnut Tee and Dress from GraciousThreads.com, and as soon as I figure out how to insert links, you can get the pattern, too! Eeek! A fake zipper front! I’m very excited. I have been searching for one for a long time to sew for my boys. A dear friend of mine gave me this “children’s” pattern the other day, and I was pleased to discover there was a fake fly front! Bad marketing on the part of the pattern company, I think…only girls on the front pic, and it doesn’t even show the fly! I am very excited to sew this pattern up in the fun minky print. But guess what. I’m scared! In my teenage years I sewed some Vouge pattern pants for myself with a real zip in them. It was….challenging. Now I sew with many distractions, and that kind of difficult could be disastrous…. So I am going to make the same pattern twice. First, in a gorgeous navy blue suiting I bought for boys church pants, then, when I’m feeling confident, in the shifty tricky minky. Stay tuned!! !